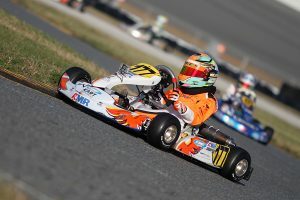 The unofficial start of a new karting season takes place every year right after Christmas at the Daytona International Speedway in Daytona Beach, Florida. The World Karting Association’s Manufacturers Cup Series has been visiting DIS for close to 20 years and Comet Racing Engines customers were ready to try and add their name as winners at the historic grounds. Christian Miles had a dominant weekend in the Mini Swift class. Christian qualified pole both days, won both Prefinals and the Finals by 6 seconds and 5 seconds respectfully with his Comet Racing Engines Swift driving for KartSport North America. 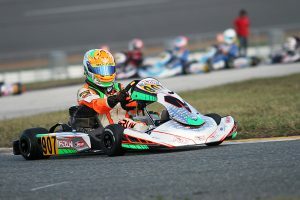 Max Garcia, the 2018 Superkarts! USA Micro Swift Champion, had a strong debut in Mini Swift competition with a fourth on Saturday and sixth on Sunday. KA100 Senior Day 1 saw multiple strong finishes by Comet Racing Engines racers with Spike Kohlbecker finishing on the podium in third, Kaden Wharff in fifth, Hunter Richardson 11th, Olivia Riedling 16th and Brad Brittin in 19th after falling ill during the Final and having to pull off track along with Preston Taylor in 22nd with a DNF. Day 2 in KA100 Senior saw Brandon Lemke subbing for an ill Brad Brittin. The multi-time national champion qualified on the pole, won the Prefinal by 2.4 seconds and the Final by 3.7 seconds with a Comet Racing Engines KA100! Kaden Wharff was 6th, Hunter Richardson 16th, Preston Taylor 19th, Spike Kohlbecker and Olivia Riedling were 20th and 21st with DNF’s in the Final. New for 2019 the Cadet Briggs 206 class had a great turnout with 30 karts on the grid. On Saturday, Kasey Williams looked to have the dominant kart in the final after hitting the track with rain tires after a brief shower. Unfortunately, the strategy was derailed by a lengthy red flag that allowed the track to dry sufficiently for the slick tire karts to catch Kasey with only 5 laps to go. Williams ended up 4th at the checkered with Nash Gierke 5th, Ben Maier 6th, Scotty Wilkins 16th and Kolin Kiefer 19th. On Sunday Ben Maier came out firing, earning the pole in qualifying, winning the Prefinal by a sizable margin and winning the Final with his Comet Racing Engine Briggs 206! Kasey Williams was 10th in the Final with Nash Gierke 11th, Scotty Wilkins 18th and Kolin Kiefer 21st. Moving up to the Junior ranks in 2019, Logan Adams had a solid debut in KA100 Junior with a pair of 5th place finishes in the Final both days. On Saturday, Garrett Davis was 14th, Nolan Baltz was 17th and Evan Hammond 19th. Sunday Nolan Baltz improved to 15th, Evan Hammond was up a spot to 18th and Garrett Davis had a DNF in the final to end up 22nd. The IAME Micro Swift class continues to see strong entries as many of the sports future stars continue their apprenticeships with many running in their first national level kart race. Saturday’s Micro Swift Final saw Nash Gierke finish 6th, Levi Copass 12th, Parker Garrigus 17th, Mason Macrander 20th, Caleb Tarter 24th and Isaac Malcuit in 25th. On Sunday in Micro Swift Nash Gierke was 6th again with Levi Copass improving for a top ten finish, Caleb Tarter had a good day with a 15th place finish in the Final, Parker Garrigus in 19th, Isaac Malcuit improved to 20th and Mason Macrander’s race was cut short with a DNF in 27th. In IAME Junior, Ian Quinn was making his debut in the class but Saturday did not start out as he would have hoped as a faulty wiring harness caused him not to make a lap in qualifying. Lining up 25th in the Prefinal, Quinn had a very strong run to finish 12th and in the Final he put on a great show moving up 8 spots to finish 4th! The Sunday final was not as kind as Quinn ran 7th until the final lap when he had to take evasive maneuvers to miss an accident that sent him off track to a 14th place finish. Connor Ferris started the weekend out very strong running 2nd in the final two practices on Friday and 3rd in Saturday’s morning warm up. 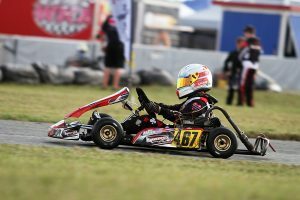 With new tires on the kart Ferris would struggle with the chassis setup in the races with an 18th on Saturday and a 15th place finish on Sunday. In IAME Senior, Tahlon Yockel had plenty of speed all weekend with a 6th on Saturday in the Final, Hunter Peri was 27th with a DNF. On Sunday Tahlon Yockel qualified and finished the Prefinal both in the top 5 but suffered a DNF in the final. Hunter Peri improved to 24th on Sunday. The Margay Ignite class had a huge turnout as the single make class saw hard racing throughout the field. Veteran kart racer Jeff Jewell had strong runs in the class both days finishing on the podium in 3rd with a Comet Racing Engines Briggs 206. It was a strong weekend for Comet Racing Engines and we can’t thank our customers enough for all their hard work and commitment. 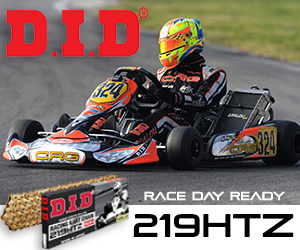 The Comet Team is back in action again in Florida for the first round of the Superkarts! USA Winter Series in Homestead January 11-13.